This article is about the film. For the video game, see Pirates of the Caribbean: Dead Man's Chest (video game). For the soundtrack, see Pirates of the Caribbean: Dead Man's Chest (soundtrack). Pirates of the Caribbean: Dead Man's Chest is a 2006 American fantasy swashbuckler film, the second installment of the Pirates of the Caribbean film series and the sequel to Pirates of the Caribbean: The Curse of the Black Pearl (2003). It was directed by Gore Verbinski, written by Ted Elliott and Terry Rossio, and produced by Jerry Bruckheimer. In the film, the wedding of Will Turner (Orlando Bloom) and Elizabeth Swann (Keira Knightley) is interrupted by Lord Cutler Beckett (Tom Hollander), who wants Turner to acquire the compass of Captain Jack Sparrow (Johnny Depp) in a bid to find the Dead Man's Chest. Sparrow discovers his debt to Davy Jones (Bill Nighy) is due. Two sequels to Pirates of the Caribbean: The Curse of the Black Pearl were conceived in 2004, with Elliott and Rossio developing a story arc that would span both films. Filming took place from February to September 2005 in Palos Verdes, Saint Vincent and the Grenadines, Dominica, and The Bahamas, as well as on sets constructed at Walt Disney Studios. It was shot back-to-back with the third film of the series, At World's End. 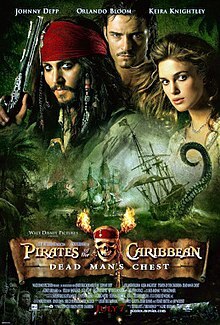 Dead Man's Chest was released in the United States on July 7, 2006, and received mixed reviews, with praise for its special effects, action sequences, Hans Zimmer's musical score, humor, and performances, particularly those of Depp and Nighy, but criticism for its convoluted plot and running time. The film broke several records at the time, including the opening-weekend record in the United States with $136 million, the fastest film to gross over $1 billion at the worldwide box office (63 days), the highest grossing first sequel at the worldwide box office and became the highest-grossing film of 2006. It currently ranks as the 26th highest-grossing film of all time worldwide and held the record as the highest-grossing film released by the Walt Disney Studios for nearly four years until it was surpassed by Toy Story 3 (2010). The film received Academy Award nominations for Best Art Direction, Sound Editing, Sound Mixing, and won the Academy Award for Best Visual Effects. Its sequel, At World's End, was released the following year. The wedding of Will Turner and Elizabeth Swann is halted when Lord Cutler Beckett, chairman of the East India Trading Company, arrives with arrest warrants for them, and also for Commodore James Norrington, who allowed Captain Jack Sparrow to escape. Norrington has resigned and disappeared after losing the Navy's flagship, HMS Dauntless, in a hurricane while pursuing Jack. Meanwhile, Jack is visited by Will's father, Bootstrap Bill Turner, aboard the Black Pearl. Bootstrap is now a crewman on the Flying Dutchman, captained by Davy Jones. Jack previously bartered a deal with Jones to raise the Pearl from the depths; now Jack must join Jones' crew or be dragged to Davy Jones' Locker by the Kraken. Beckett, meanwhile, promises to free Elizabeth if Will brings him Jack's magic compass which points to whatever the holder wants most. Will finds Jack and the crew on an island and frees them from cannibals. Shortly after, Governor Swann frees Elizabeth from jail, but he is then captured. Elizabeth bargains with Beckett to find the compass. Disguised as a cabin boy aboard a Scottish merchant vessel, she makes her way to Tortuga where she later finds Jack and also a drunken Norrington. After escaping the cannibals, Jack and the crew visit voodoo priestess Tia Dalma, who reveals Jones' weakness is his heart, which is locked within the Dead Man's Chest. Jack must find it and the key that opens it. Locating the Dutchman, Will makes a deal with Jack to find the key to the chest in return for Jack's compass. Jack tricks Will, who is shanghaied into service aboard the Dutchman. Jones agrees to release Jack from their bargain in exchange for one hundred souls. Will meets his father aboard the Dutchman and learns that Jones possesses the key to the chest. They play a game of Liar's Dice against Jones to try and win the key, but they lose. Despite this, Will escapes with the key and is taken aboard the same ship Elizabeth was on. Jones sends the Kraken after him, sinking the ship, but Will escapes. In Tortuga, Jack hires a new crew, including Elizabeth and Norrington. With Elizabeth's use of Jack's compass, they are able to locate the chest. All parties arrive on Isla Cruces, where the chest is buried, but a three-way sword fight breaks out between Jack, Will, and Norrington, who all want the heart for their respective goals: Jack wants to call off the Kraken; Will wants to rescue his father; and Norrington wants to regain his life as a Navy officer. In the chaos, Norrington secretly steals the heart and runs off, pretending to lure away the Dutchman's crew. Jones attacks the Pearl with the Kraken, which kills most of the crew and destroys all but one of the Pearl's lifeboats, but Jack, who briefly flees the battle, returns and wounds the Kraken with a net full of gunpowder and rum. Jack orders the survivors to abandon ship, but Elizabeth, realizing the Kraken only wants Jack, tricks him and chains him to the mast so that the crew can escape. The Kraken drags Jack and the Pearl to Davy Jones' Locker. Jones opens the chest to discover his heart is gone. In Port Royal, Norrington gives Beckett the heart and the Letters of Marque meant for Jack, allowing him back into the navy as well as allowing Beckett to gain control of Davy Jones and the seas. The Pearl's crew take shelter with Tia Dalma, where they all agree to rescue Jack. Tia Dalma introduces the captain who will guide them: the resurrected Hector Barbossa. In a post-credits scene, the cannibalistic tribe now worships the prison dog in replacement of Jack. Johnny Depp as Captain Jack Sparrow: Captain of the Black Pearl. He is hunted by the Kraken because of his unpaid blood debt to Davy Jones. He is also searching for the Dead Man's Chest to free himself from Jones' servitude. Orlando Bloom as Will Turner: A blacksmith-turned-pirate who strikes a deal with Cutler Beckett to find Jack Sparrow and his compass so he can save both himself and his fiancée Elizabeth from execution. Later he is reunited with, and seeks to free, his father, who eventually owes a lifetime of servitude to Davy Jones. Keira Knightley as Elizabeth Swann: Governor Swann's daughter and Will's fiancée, who is arrested on her wedding day for helping Captain Jack Sparrow escape. Escaping jail with help from her father, she meets up with Jack in Tortuga and joins his crew to search for both Will and the chest. Bill Nighy as Davy Jones: Captain of the Flying Dutchman. Davy Jones was once a human being. Unable to bear the pain of losing his true love, he carved out his heart and put it into the Dead Man's Chest, then buried it in a secret location. He has become a bizarre creature – part octopus, part crab, part man – and collects the souls of dead or dying sailors to serve aboard his ship for one hundred years. Jack Davenport as James Norrington: He resigned his commission as Commodore in the Royal Navy after losing his ship and crew in a hurricane in the pursuit of Jack Sparrow and his crew. Fallen on hard times and into alcoholism, he joins the Black Pearl's crew and seeks to regain his honor and career. Stellan Skarsgård as "Bootstrap Bill" Turner: A crewman aboard the Flying Dutchman who so happens to be Will Turner's father. He was cursed by the Aztec gold on Isla de Muerta (along with Hector Barbossa's crew). Thrown overboard after refusing to take part in the mutiny against Jack led by Barbossa, he spent years bound to a cannon beneath the crushing ocean. Found by Davy Jones, he swore to servitude aboard the Flying Dutchman crew and escaped death. Kevin McNally as Joshamee Gibbs: The Black Pearl's first mate and Jack Sparrow's loyal friend, he once served in the Royal Navy under Lieutenant James Norrington. Tom Hollander as Lord Cutler Beckett: Chairman of the East India Trading Company, he travels to Port Royal to capture and recruit Jack Sparrow as a privateer. What he really desires is Davy Jones' heart, with which he can rule the seas with Jones' commanded servitude. Lee Arenberg as Pintel: A pirate and former Black Pearl crewmember under Captain Barbossa, he was imprisoned after the Aztec curse was broken, but escaped to rejoin Jack Sparrow's Black Pearl crew. Mackenzie Crook as Ragetti: Pintel's inseparable crewmate. He has a wooden eye, and despite being illiterate, has begun "reading" the Bible, with the excuse that "you get credit for trying." Naomie Harris as Tia Dalma: An obeah priestess who Jack Sparrow bartered with for his magic compass. She explains the legend of Davy Jones, in addition to owning a similar locket to his. Jonathan Pryce as Governor Weatherby Swann. Elizabeth's father and governor of Port Royal. He adores his daughter but puts little faith in Will - not considering him the best match for Elizabeth. Geoffrey Rush as Hector Barbossa: Barbossa's character is resurrected in the final scene of this film. Having met his demise in the previous installment, Barbossa is resurrected by the character Tia Dalma in order to save Jack Sparrow from Davy Jones' locker, therefore allowing a Brethren Court conclave in order to "release" Calypso from her Human Bonds. For this role, Rush was uncredited. Following the success of Pirates of the Caribbean: The Curse of the Black Pearl (2003), the cast and crew signed on for two more sequels to be shot back-to-back, a practical decision on Disney's part to allow more time with the same cast and crew. Writer Ted Elliott and Terry Rossio decided not to make the sequels new adventures featuring the same characters, as with the Indiana Jones and James Bond series, but to retroactively turn The Curse of the Black Pearl into the first of a trilogy. They wanted to explore the reality of what would happen after Will Turner and Elizabeth Swann's embrace at the end of the first film, and initially considered the Fountain of Youth as the plot device. They settled on introducing Davy Jones, the Flying Dutchman and the Kraken. They also introduced the historical East India Trading Company, who for them represented a counterpoint to the themes of personal freedom represented by pirates. Planning began in June 2004, and production was much larger than The Curse of the Black Pearl, which was only shot on location in St. Vincent. This time, the sequels would require fully working ships, with a working Black Pearl built over the body of an oil tanker in Bayou La Batre, Alabama. By November, the script was still unfinished as the writers did not want director Gore Verbinski and producer Jerry Bruckheimer to compromise what they had written, so Verbinski worked with James Byrkit to storyboard major sequences without need of a script, while Elliott and Rossio wrote a "preparatory" script for the crew to use before they finished the script they were happy with. By January 2005, with rising costs and no script, Disney threatened to cancel the film, but changed their minds. The writers would accompany the crew on location, feeling that the lateness of their rewrites would improve the spontaneity of the cast's performances. The two bone cages used in one of the opening scenes of the film. The cages were on display on the Studio Backlot Tour at Disney's Hollywood Studios until it closed in 2014. Principal photography began on February 28, 2005, in Palos Verdes, beginning with Elizabeth's ruined wedding day. The crew spent the first shooting days at Walt Disney Studios in Los Angeles, including the interiors of the Black Pearl and the Edinburgh Trader which Elizabeth stows away on, before moving to St. Vincent to shoot the scenes in Port Royal and Tortuga. Sets from the previous film were reused, having survived three hurricanes, although the main pier had to be rebuilt as it had collapsed in November. The crew had four tall ships at their disposal to populate the backgrounds, which were painted differently on each side for economy. One of the ships used was the replica of HMS Bounty used in the 1962 film adaptation of Mutiny on the Bounty. On April 18, 2005, the crew began shooting at Dominica, a location Verbinski had selected as he felt it fitted the sense of remoteness he was looking for. However, this was also a problem; the Dominican government were completely unprepared for the scale of a Hollywood production, as while the 500-strong crew occupying around 90% of the roads on the island they had trouble moving around on the underdeveloped surfaces. The weather also alternated between torrential rainstorms and hot temperatures, the latter of which was made worse for the cast who had to wear period clothing. At Dominica, the sequences involving Pelegosto (Cannibal Island) and the forest segment of the battle on Isla Cruces were shot. Verbinski preferred to use practical props for the giant wheel and bone cage sequences, feeling long close-up shots would help further suspend the audience's disbelief. Dominica was also used for Tia Dalma's shack. Filming on the island concluded on May 26, 2005. The crew moved to a small island in the Bahamas called White Cay for the beginning and end of the Isla Cruces battle, before production took a break until August, where in Los Angeles the interiors of the Flying Dutchman were shot. On September 18, 2005, the crew moved to Grand Bahama Island to shoot ship exteriors, including the working Black Pearl and Flying Dutchman. Filming there was a tumultuous period, starting with the fact that the tank had not actually been finished. The hurricane season caused many pauses in shooting, and Hurricane Wilma damaged many of the accessways and pumps, though no one was hurt nor were any of the ships destroyed. Filming completed on September 10, 2005. The three stages of animating Bill Nighy's character. The Flying Dutchman's crew members were originally conceived by writers Ted Elliott and Terry Rossio as ghosts, but Gore Verbinski disliked this and designed them as physical creatures. Their hierarchy is reflected by how mutated they were: newcomers had low level infections which resemble rosacea, while veterans had full-blown undersea creature attributes. Verbinski wanted to keep them realistic, rejecting a character with a turtle shell, and the animators watched various David Attenborough documentaries to study the movement of sea anemones and mussels. All of the crew are computer-generated, with the exception of Stellan Skarsgård, who played "Bootstrap" Bill Turner. Initially his prosthetics would be augmented with CGI but that was abandoned. Skarsgård spent four hours in the make-up chair and was dubbed "Bouillabaisse" on set. 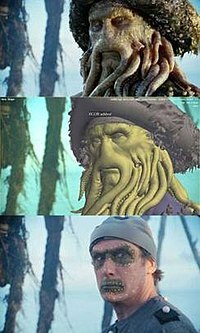 Captain Davy Jones had originally been designed with chin growths, before the designers made the move to full-blown tentacles; the skin of the character incorporates the texture of a coffee-stained Styrofoam cup among other elements. To portray Jones on set, Bill Nighy wore a motion capture tracksuit that meant the animators at Industrial Light & Magic did not have to reshoot the scene in the studio without him or on the motion capture stage. Nighy wore make-up around his eyes and mouth to splice into the computer-generated shots, but the images of his eyes and mouth were not used. Nighy only wore a prosthetic once, with blue-colored tentacles for when Will Turner (Orlando Bloom) steals the key to the Dead Man's Chest from under his "beard" as he sleeps. To create the CG version of the character, the model was closely based on a full-body scan of Nighy, with Jones reflecting his high cheekbones. Animators studied every frame of Nighy's performance: the actor himself had blessed them by making his performance more quirky than expected, providing endless fun for them. His performance also meant new controls had to be stored. Finally, Jones' tentacles are mostly a simulation, though at times they were hand-animated when they act as limbs for the character. The Kraken was difficult to animate as it had no real-life reference, until animation director Hal Hickel instructed the crew to watch King Kong vs. Godzilla which had a real octopus crawling over miniatures. On the set, two pipes filled with 30,000 pounds of cement were used to crash and split the Edinburgh Trader: Completing the illusion are miniature masts and falling stuntmen shot on a bluescreen stage. The scene where the Kraken spits at Jack Sparrow does not use computer-generated spit: it was real gunge thrown at Johnny Depp. Pirates of the Caribbean: Dead Man's Chest premiered at Disneyland in California on June 24, 2006. It was the first Disney film to use the new computer-generated Walt Disney Pictures production logo, which took a year for the studio to design. Weta Digital was responsible for the logo's final animated rendering and Mark Mancina was hired to score a new composition of "When You Wish Upon a Star". The main people responsible for the logo's rendering are Cyrese Parrish and Cameron Smith. The first trailer was attached to The Chronicles of Narnia: The Lion, the Witch and the Wardrobe. 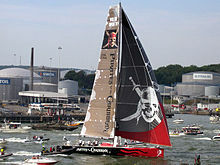 Disney produced a comic book adaption in their Junior Graphic Novels: Pirates of the Caribbean: Dead Man's Chest (2007) Disney sponsored a racing yacht in the 2005 edition of the Volvo Ocean Race. The boat, aptly named Black Pearl, raced under the team name "Pirates of the Caribbean" for the United States. The boat itself was a Volvo Open 70 class yacht designed by Farr Yacht Design. She was skippered to a 2nd-place finish by American Paul Cayard after 31,000 nm (57,000 km), divided into 9 legs, taking 8 months to complete. The film became available on DVD on November 20, 2006 in the UK and December 5, 2006 in the US. It sold 9,498,304 units in its first week of sales (equivalent to $174,039,324). In total it sold 16,694,937 units, earning $320,871,909. It was the best-selling DVD of 2006 in terms of units sold and second in terms of sales revenue behind The Chronicles of Narnia: The Lion, the Witch and the Wardrobe. The DVD contained a commentary track with the screenwriters and a gag reel, with the double-disc featuring a video of the film premiere and a number of documentaries, including a full-length documentary entitled "According to the Plan" and eight featurettes. The film was released on Blu-ray Disc on May 22, 2007. The film had its UK Television premiere on Boxing Day 2008 on BBC One at 20:30. It was seen by 6.8 million viewers according to overnight figures. Pirates of the Caribbean: Dead Man's Chest received mixed reviews. On Rotten Tomatoes, the film has an approval rating of 53% based on 221 reviews, with an average rating of 6/10. The site's critical consensus reads, "Gone is Depp's unpredictability and much of the humor and originality of the first movie." At Metacritic, which assigns a weighted average rating to reviews, the film received an average score of 53 out of 100, based on 37 critics, indicating "mixed to average reviews". Audiences polled by CinemaScore gave the film an average grade of "A–" on an A+ to F scale. Michael Booth of the Denver Post gave the film three-and-a-half stars out of four, calling it "two hours and 20 minutes of escapism that once again makes the movies safe for guilt-free fun." Drew McWeeny compared the film to The Empire Strikes Back, and also acclaimed its darkness in its depiction of the crew of the Flying Dutchman and its cliffhanger. The completely computer-generated Davy Jones turned out to be so realistic that some reviewers mistakenly identified Nighy as wearing prosthetic makeup. A. O. Scott of The New York Times said, "You put down your money – still less than $10 in most cities – and in return you get two and a half hours of spirited swashbuckling, and Gore Verbinski has an appropriate sense of mischief, as a well as a gift, nearly equaling those of Peter Jackson and Steven Spielberg, for integrating CGI seamlessly into his cinematic compositions." Empire magazine gave the film 3 stars saying "Depp is once again an unmitigated joy as Captain Sparrow, delivering another eye-darting, word-slurring turn with some wonderful slapstick flourishes. Indeed, Rossio and Elliot smartly exploit these in some wonderful action set-pieces." "We don't get the predictable 'all friends together on the same quest' structure, and there's a surfeit of surprises, crosses and double-crosses and cheeky character beats which stay true to the original's anti-heroic sense of fun. After all, Jack Sparrow is a pirate, a bad guy in a hero's hat, a man driven by self-gain over concern for the greater good, who will run away from a fight and cheat his 'friends' without a second's thought." Lord McLovin of MovieWeb said "The second tale of Captain Jack Sparrow is another epic adventure!" Paul Arendt of the BBC compared it to The Matrix Reloaded, as a complex film that merely led onto the next film. Richard George felt a "better construct of Dead Man's Chest and At World's End would have been to take 90 minutes of Chest, mix it with all of End and then cut that film in two." Alex Billington felt the third film "almost makes the second film in the series obsolete or dulls it down enough that we can accept it in our trilogy DVD collections without ever watching it." Dead Man's Chest earned $423,315,812 in the North America and $642,863,913 in other territories, for a worldwide total of $1,066,179,725. Worldwide, it ranks as the 24th highest-grossing film, the 12th highest-grossing film distributed by Disney, the highest-grossing film of 2006, the third highest-grossing film of the 2000s, the highest-grossing film in the Pirates of the Caribbean series, the highest-grossing film to star Johnny Depp and the second highest-grossing second installment in a franchise (behind Incredibles 2). It was the third film in history to reach the $1 billion mark worldwide, and it reached the mark in record time (63 days), a record that has since been surpassed by many films, of which the first was Avatar (in January 2010). In North America, the film broke many records including the largest opening- and single-day gross ($55.8 million), the biggest opening-weekend gross ($135.6 million), the least time to reach $100, $200 and $300 million and the highest ten-day gross. However, most of them were broken by Spider-Man 3 in May 2007 and The Dark Knight in July 2008. The film was in first place at the box office for three consecutive weekends. It closed in theaters on December 7, 2006, with a $423.3 million haul. Thus, in North America, it is the seventeenth-highest-grossing film, although, adjusted for inflation, the film ranks forty-eight. It is also the highest-grossing 2006 film, the highest-grossing Pirates of the Caribbean film, and the seventh-highest-grossing Disney film. The film sold an estimated 64,628,400 tickets in the US. Outside North America, it is the twenty-first-highest-grossing film, the third-highest-grossing Pirates film, the eighth-highest-grossing Disney film and the highest-grossing film of 2006. It set opening-weekend records in Russia and the CIS, Ukraine, Finland, Malaysia, Singapore, Greece and Italy. It was on top of the box office outside North America for 9 consecutive weekends and 10 in total. It was the highest-grossing film of 2006 in Australia, Bulgaria, Germany, Japan, the Netherlands, New Zealand, Spain, Sweden and Thailand. At the 79th Academy Awards, visual effects supervisors John Knoll, Hal Hickel, Charles Gibson, and Allen Hall won an Oscar for Best Visual Effects, which was also the first time since 1994's Forrest Gump that Industrial Light & Magic had received that particular Academy Award. The film was also nominated for Best Art Direction, Sound Editing, and Sound Mixing. The film also won a BAFTA and Satellite award for Best Visual Effects, and six awards from the Visual Effects Society. Other awards won by the film include Choice Movie: Action, Choice Movie Actor: Action for Johnny Depp at the 2006 Teen Choice Awards; Favorite Movie, Movie Drama, Male Actor for Depp and On-Screen Couple for Depp and Keira Knightley at the 33rd People's Choice Awards; Best Movie and Performance for Depp at the 2007 MTV Movie Awards and Best Special Effects at the Saturn Awards, and Favorite Movie at the 2007 Kids' Choice Awards. A video game adaptation of the film was developed by Griptonite Games and Amaze Entertainment and released by Buena Vista Games in June–August 2006 for the PlayStation Portable, Nintendo DS and Game Boy Advance. ^ "Pirates of the Caribbean - Dead Man's Chest". British Board of Film Classification. June 23, 2006. Archived from the original on March 6, 2016. Retrieved February 7, 2015. ^ a b c "Pirates of the Caribbean: Dead Man's Chest (2006)". Box Office Mojo. Archived from the original on April 24, 2013. Retrieved February 3, 2009. ^ Bresnan, Conor (September 11, 2006). "Around the World Roundup: 'Cars' Dethrones Billion-Dollar 'Pirates'". Archived from the original on May 11, 2013. Retrieved October 18, 2011. ^ Brian Linder (October 21, 2003). "Back-to-Back Pirates". IGN. Archived from the original on June 13, 2007. Retrieved May 12, 2007. ^ a b c d e According to Plan: The Harrowing and True Story of Dead Man's Chest (DVD)|format= requires |url= (help). Buena Vista. 2006. ^ Ted Elliott, Terry Rossio (2006). Audio Commentary (DVD)|format= requires |url= (help). Buena Vista. ^ a b c d Charting the Return (DVD)|format= requires |url= (help). Buena Vista. 2006. ^ "Everything Relates Back to What Started Everything Off in the First". Production Notes. Archived from the original on September 27, 2007. Retrieved May 23, 2007. ^ "2005 (and `06): A Pirate Odyssey". Production Notes. Archived from the original on September 27, 2007. Retrieved May 23, 2007. ^ a b "Los Angeles: The Voyage Begins". Production Notes. Archived from the original on September 27, 2007. Retrieved May 24, 2007. ^ "Brando's bounty's sailing in." Bristol Evening Post. Pg. 6. July 5, 2007. ^ "Logsdon rows to the occasion." Matthew Horn Matthew Horn News Herald Pg.1 (Port Clinton, Ohio). June 26, 2007. ^ "Shooting in Isle of Beauty, Isle of Splendor". Production Notes. Archived from the original on September 27, 2007. Retrieved May 24, 2007. ^ "Beware of Falling Coconuts: Adventures in Dominica". Production Notes. Archived from the original on September 27, 2007. Retrieved May 24, 2007. ^ ""Please Do Not Feed the Iguanas": The Exumas, and an L.A. Sojourn". Production Notes. Archived from the original on September 27, 2007. Retrieved May 24, 2007. ^ "Back to the Bahamas, Hurricanes and All". Production Notes. Archived from the original on September 4, 2007. Retrieved May 29, 2007. ^ Ted Elliott. "MOVIES Message Board – ARCHIVE 7". Wordplay Forums. Retrieved July 9, 2006. ^ Iain Blair (July 1, 2006). "Cover story: 'pirates of the caribbean: dead man's chest'". Post. Archived from the original on August 27, 2013. Retrieved May 24, 2007. ^ Rebecca Murray. "John Knoll Talks About the Visual Effects in the Pirates Movies". About.com. Archived from the original on April 16, 2013. Retrieved May 23, 2007. ^ Jason Matloff. "Scene Stealer: Stellan Skarsgård". Premiere. Archived from the original on June 8, 2007. Retrieved June 5, 2007. ^ Sam Ashurst (May 14, 2007). "Orlando and Keira: Uncut!". Total Film. Archived from the original on June 9, 2008. Retrieved May 24, 2007. ^ Edward Douglas (June 12, 2006). "Exclusive: Pirates' Bill "Davy Jones" Nighy". Comingsoon.net. Archived from the original on June 10, 2008. Retrieved May 24, 2007. ^ Meet Davy Jones: Anatomy of a Legend (DVD)|format= requires |url= (help). Buena Vista. 2006. ^ Rebecca Murray (November 3, 2006). "Behind the Scenes of the "Pirates of the Caribbean" Movies". About.com. Archived from the original on September 20, 2012. Retrieved May 23, 2007. ^ Creating the Kraken (DVD)|format= requires |url= (help). Buena Vista. 2006. ^ a b "Old Disney magic in new animated logo". hollywoodreporter.com. Archived from the original on July 18, 2006. Retrieved July 10, 2006. ^ "Pirates of the Caribbean: Dead Man's Chest (Disney Junior Graphic Novel #4)". Goodreads. Retrieved November 29, 2016. ^ "Pirates of the Caribbean: Dead Man's Chest – DVD Sales". Archived from the original on June 13, 2013. Retrieved March 17, 2007. ^ "Disney Sets 'Pirates,' 'Cars' Blu-ray Dates". High-Def Digest. January 24, 2007. Archived from the original on February 11, 2012. Retrieved January 27, 2007. ^ John Plunkett. "TV ratings - 26 December: Pirates of the Caribbean is ratings treasure for the BBC". the Guardian. Archived from the original on March 4, 2016. ^ "Pirates of the Caribbean: Dead Man's Chest (2006)". Rotten Tomatoes. Fandango Media. Archived from the original on May 30, 2013. Retrieved September 4, 2006. ^ "Pirates of the Caribbean: Dead Man's Chest". Metacritic. CBS Interactive. Archived from the original on January 21, 2013. Retrieved August 21, 2010. ^ Michael Booth (July 6, 2005). "Aye, mates: "Pirates" sequel is worth the doubloons". Denver Post. Archived from the original on October 14, 2012. Retrieved July 23, 2006. ^ Drew McWeeny (June 25, 2005). "Moriarty Reviews PIRATES OF THE CARIBBEAN 2: DEAD MAN'S CHEST!!". Ain't It Cool News. Archived from the original on December 9, 2012. Retrieved May 29, 2007. ^ Russ Breimeier. "Pirates of the Caribbean: Dead Man's Chest". Christianity Today. Archived from the original on July 12, 2006. Retrieved May 29, 2006. ^ Ryan Gilbey (July 10, 2006). "Sun, sea, sand and horror". New Statesman. UK. Archived from the original on May 11, 2013. Retrieved May 29, 2007. ^ Scott, A. O. (July 7, 2006). "Pirates of the Caribbean: Dead Man's Chest - Review - Movies". The New York Times. ^ "Empire's Pirates of the Caribbean Pirates of the Caribbean: Dead Man's Chest Movie Review". Empireonline.com. Archived from the original on November 6, 2012. Retrieved July 6, 2013. ^ 7 Like6 Dislike0 (May 9, 2012). "Pirates of the Caribbean: Dead Man's Chest Review By Ghostman". MovieWeb.com. Archived from the original on August 27, 2013. Retrieved July 6, 2013. ^ Paul Arendt (July 7, 2006). "Pirates of the Caribbean: Dead Man's Chest (2006)". BBC. Archived from the original on March 29, 2008. Retrieved May 29, 2007. ^ Richard George (May 24, 2007). "Comics at World's End: Adapting Pirates of the Caribbean". IGN. Archived from the original on October 18, 2007. Retrieved May 29, 2007. ^ Alex Billington (May 22, 2007). "Get Ready for a Swarm of Negative Critics This Friday on Pirates 3". Firstshowing.net. Archived from the original on May 24, 2007. Retrieved May 29, 2007. ^ "WORLDWIDE GROSSES". Box Office Mojo. Archived from the original on July 26, 2013. Retrieved April 23, 2017. ^ a b "Pirates of the Caribbean". boxofficemojo.com. Archived from the original on April 25, 2013. ^ "Around the World Roundup: 'Cars' Dethrones Billion-Dollar 'Pirates'". Box Office Mojo. Archived from the original on May 11, 2013. Retrieved October 16, 2011. ^ "Weekend Report: 'Avatar' Rocks New Year's". Box Office Mojo. Archived from the original on May 11, 2013. Retrieved October 16, 2011. ^ a b "'Pirates' Raid Record Books". Box Office Mojo. Archived from the original on May 13, 2013. Retrieved January 24, 2012. ^ "'Pirates' Loot Piles Up, 'Lady' Walks Plank". Box Office Mojo. July 24, 2006. Archived from the original on May 12, 2013. Retrieved January 24, 2012. ^ "'Pirates' Pilfer More Records". Box Office Mojo. July 17, 2006. Archived from the original on May 12, 2013. Retrieved January 24, 2012. ^ "'Spider-Man 3' Soars into Record Books". Box Office Mojo. May 7, 2007. Archived from the original on October 26, 2012. Retrieved January 24, 2012. ^ Gray, Brandon (July 24, 2006). "'Pirates' Loot Piles Up, 'Lady' Walks Plank". Box Office Mojo. Archived from the original on May 12, 2013. Retrieved March 11, 2012. ^ "Pirates of the Caribbean: Dead Man's Chest". Box Office Mojo. Archived from the original on May 13, 2013. Retrieved October 16, 2011. ^ "2006 DOMESTIC GROSSES". Box Office Mojo. Archived from the original on April 25, 2013. Retrieved February 11, 2012. ^ "BUENA VISTA". Box Office Mojo. Archived from the original on April 24, 2013. Retrieved April 9, 2017. ^ "Pirates of the Caribbean: Dead Man's Chest". Box Office Mojo. Archived from the original on March 4, 2016. Retrieved May 30, 2016. ^ "All Time Worldwide Box Office Grosses". boxofficemojo.com. Archived from the original on May 10, 2013. ^ "All Time Worldwide Box Office Grosses". boxofficemojo.com. Archived from the original on September 7, 2013. ^ "2006 Overseas Total Yearly Box Office Results". boxofficemojo.com. Archived from the original on November 19, 2012. ^ "Around the World Roundup: 'Pirates' Dominates Again". Box Office Mojo. Archived from the original on March 20, 2013. Retrieved October 16, 2011. ^ "Around the World Roundup: Yo Ho, Yo Ho, Eight in a Row". Box Office Mojo. Archived from the original on March 20, 2013. Retrieved October 16, 2011. ^ "Around the World Roundup: 'Pirates' Reclaims Crown with Italian Record". Box Office Mojo. Archived from the original on May 11, 2013. Retrieved October 16, 2011. ^ "International Box Office Results". Box Office Mojo. Archived from the original on May 12, 2013. Retrieved April 8, 2010. ^ "Around the World Roundup: 'Pirates' Swishes to Nine Straight". Box Office Mojo. September 6, 2006. Archived from the original on May 12, 2013. Retrieved October 16, 2011. ^ "Australia Yearly Box Office". Box Office Mojo. Archived from the original on October 17, 2012. ^ "Bulgaria Yearly Box Office". Box Office Mojo. Archived from the original on August 6, 2011. ^ "Germany Yearly Box Office". Box Office Mojo. Archived from the original on March 31, 2012. ^ "Japan Yearly Box Office". Box Office Mojo. Archived from the original on February 11, 2017. ^ "Netherlands Yearly Box Office". Box Office Mojo. Archived from the original on March 31, 2012. ^ "New Zealand and Fiji Yearly Box Office". Box Office Mojo. Archived from the original on August 24, 2011. ^ "Spain Yearly Box Office". Box Office Mojo. Archived from the original on November 20, 2011. ^ "Sweden Yearly Box Office". Box Office Mojo. Archived from the original on October 22, 2012. ^ "Thailand Yearly Box Office". Box Office Mojo. Archived from the original on November 14, 2011. ^ "The 79th Academy Awards (2007) Nominees and Winners". oscars.org. Archived from the original on September 29, 2012. Retrieved November 20, 2011. ^ "Pirates of the Caribbean: Dead Man's Chest Awards". Allmovie. Archived from the original on May 17, 2013. Retrieved May 23, 2007. ^ "Visual Effects Society Fifth Annual V.E.S. Awards Announced". Visual Effects Society. February 11, 2007. Archived from the original on May 8, 2013. Retrieved May 24, 2007. ^ "Awards for Pirates of the Caribbean: Dead Man's Chest". IMDb. Retrieved September 17, 2007. Wikimedia Commons has media related to Pirates of the Caribbean: Dead Man's Chest.